The installation of CSIRO-designed monolithic microwave integrated circuit (MMIC) amplifiers in the Australia Telescope Compact Array, to observe radio signals with a wavelength down to 3mm, represented a world first for a radio-telescope array. With radio waves ten times smaller than used before, the telescope could ‘see’ ten times more detail in the objects studied â€” our Galaxy, stars being born, other galaxies, and gas clouds. Through the development of advanced Indium Phosphide (InP) Monolithic Microwave Integrated Circuits (MMICs), CSIRO became recognised as a world leader in the design and application of InP MMICs for radio astronomy instrumentation. The InP MMICs enabled the upgrade of the Australia Telescope Compact Array (ATCA) to operate at 3mm wavelength, making it the only millimetre-wave radio-telescope array in the Southern Hemisphere and the only one in the world to use cryogenically-cooled MMIC front-ends. The work was recognised with the award of a CSIRO Medal for Research Achievement in 2002. The team included: Dr John Archer (Joint Team Leader) – CSIRO Telecommunications and Industrial Physics; Mr Malcolm Sinclair (Joint Team Leader) – Australia Telescope National Facility; Mr Russell Gough – Australia Telescope National Facility; Ms Oya Sevimli – CSIRO Telecommunications and Industrial Physics; and Mr Paul Roberts – Australia Telescope National Facility. the invention and patenting of a ‘200 GHz millimetre-wave movie camera’ for airport and building security. A demonstration unit was built which proved the viability of the camera. A Strategic Alliance Agreement between a NGST and CSIRO enabled CSIRO to become a leading participant in international radio-astronomy projects, playing a key co-ordinating role in providing access to InP MMIC technology. Through the installation of CSIRO-designed monolithic microwave integrated circuit (MMIC) amplifiers in the Australia Telescope Compact Array, CSIRO became recognised as a world leader in the design and application of InP MMICs for radio astronomy instrumentation. Exciting new opportunities for research in astronomy have emerged from this achievement, from molecular line studies to continuum mapping, since the ATCA is the only millimetre-wave equipped radio telescope array in the Southern Hemisphere and one of only a handful in the world. But it wasn’t easy – high-resolution imaging with millimetre waves is extremely challenging and this achievement could be compared with conquering an ‘engineering Everest’. This particular ‘Everest’ was conquered within a 5-year cross-divisional project, jointly led by Dr John Archer (CTIP) and Mr Malcolm Sinclair (ATNF), which successfully combined the engineering systems and circuit design expertise of CSIRO with the resources of US-based integrated circuit manufacturer, NGST, to produce advanced indium phosphide (InP) MMICs. The success of the telescope upgrade is in large part due to innovative low-noise, high-gain InP MMIC amplifiers, able to handle the 100 GHz plus frequencies typical of millimetre wave signals. Such devices can’t be fabricated successfully using silicon, because the mobility of electrons in the widely-used semiconductor isn’t fast enough to cope with such high frequencies – frequencies that are a 1 000 times higher than television broadcasts. The higher electron mobility offered by III-V composite semiconductors such as gallium arsenide (GaAs) and, in particular, InP make these the material of choice. However, the costs associated with establishing volume production facilities for such semiconductor circuits in Australia are prohibitive. The CSIRO team’s Strategic Alliance with TRW provides a model for business where leading-edge Australian design supported by partnerships for off-shore production results in competitive, world-leading technology solutions. Radio signals from across the immense distances of intergalactic space are incredibly weak. Consequently they can be easily swamped by noise. This noise can come from space itself – in the form of the 3 K background microwave radiation – or from the Earth’s atmosphere, or even from the receiver itself. The solution is a high-gain, low-noise amplifier that is able to work in the 100 GHz range and above. In addition, the receiver needs to be able to operate at cryogenic temperatures, typically around 15 K, because this is used to dampen ‘noise’ caused by the thermal excitation of electrons in the semiconductor. Both GaAs and InP work at low temperatures, but the latter performs much better. Astronomers looking at what happens when a gas is sucked into a blackhole, or determining how stars are born, actually observe spectral ‘lines’ at discrete wavelengths generated by quantum processes within the atoms or molecules present. To detect the presence of a molecule, the astronomer needs to detect an incredibly weak ‘spike’ above any background noise. The high gain and low noise figure of the InP-based MMIC amplifier, at such high frequencies, is the key to maximising the signal-to-noise ratio for detection of these molecular resonance ‘spikes’. CSIRO’s cryogenically cooled InP MMICs produce the ultimate in sensitive, reliable receivers that can be manufactured in large quantities with reproducible performance. Prior to this achievement, radio astronomers were working with proprietary discrete transistor chips and discrete components, bonding them together to build so-called ‘hybrid-integrated’ amplifiers. These hand-crafted circuits are extremely challenging to build, particularly if more than one or two are needed. At the time the team started its work, very few, if any, laboratories were taking the integrated approach. By designing and, through collaboration with NGST, manufacturing a range of monolithic ICs, the team developed reproducible products which are now in demand by radio astronomers the world over. An IC design allows the manufacture of hundreds of identical amplifiers at a tenth of the unit cost per amplifier. For example, the first wafer produced with TRW comprised forty to fifty amplifiers for 85 to 115 GHz, more than 85% of them worked, all identically. By comparison, there is an enormous amount of effort in tuning just a single hybrid design, whereas there is none in the monolithic approach; they just work. one of the best 80-110 GHz amplifiers that has ever been made. It has the broadest bandwidth, lowest noise, and highest gain. first time in the world that cooled 75-110 GHz MMIC amplifers had been installed and used for astronomical observations in an interferometer system in the 3-mm wavelength band. development of a unique design for wideband millimetre-wave bi-directional amplifiers, demonstrating world-first wideband bi-directional amplifiers covering the bands 40-60 and 75-100 GHz. The reversible amplifier concept, which has been patented, relies upon the inherent symmetry of a common-gate HEMT. first 100 GHz voltage controlled oscillator ever reported fabricated using InP HEMTs. 30 GHz bandwidth photo-receiver/amplifiers for 1.3-1.5 mm optical fibre communications. The 3-level sampler was successfully used to implement digitisation for an A-to-D converter, which works at more than 8 Gbit/s. It formed a key part of a new generation of wideband correlator, which was developed as a backend for a new generation of radio telescopes (such as the proposed Square Kilometre Array). A key goal of the millimetre-wave upgrade of the Australia Telescope was to provide a demonstration vehicle for the real-world application of InP MMIC technology. The astronomy projects and the ongoing formal Strategic Alliance with NGST provided a framework for the two organisations to collaborate on advanced telecommunication systems. There are two key areas where the collaborative research with NGST led to significant technical breakthroughs. Millimetre-wave operation is of growing importance to the distribution of broadband telecommunication services in cities and in remote areas. At CSIRO, millimetre-wave systems research is focusing on new applications of the technology aimed at providing flexible, high-data-rate connectivity to fixed and mobile users. Millimetre-wave transceivers based on MMICs are a key component of these wideband systems. The team successfully developed novel, MMIC-based transmitter and receiver modules for the 83-87 GHz band. These modules incorporated chips designed by the CSIRO team and fabricated by NGST under the Strategic Alliance. The ICs included low-noise amplifiers, a mixer and a medium power amplifier to provide local oscillator drive for the mixer. An important challenge for designers of such radio systems, before they will find widespread acceptance in consumer applications, is to bring down their relatively high cost. These unique modules were a first step in that direction. The new receiver and transmitter were used to demonstrate a fully-functional millimetre-wave radio system at 86.1-87.4 GHz, highlighting the wide bandwidth that is available and essential for gigabit rate data communications. This work underpinned the research of the Gigabit Wireless team who were awarded the 2007 CSIRO Chairman’s Medal for developing the world’s fastest and most spectrally efficient 6 gigabit per second wireless millimetre-wave communication link. This system can transmit and receive data five times faster than any existing wireless system (see also Gigabit wireless network). Imaging systems that generate images of a scene by detecting thermally-generated millimetre-wave background radiation emitted by objects in the field of view offer significant advantages over other schemes, which provide imaging by detecting visible or infrared light. The millimetre-wave radiation can penetrate low-visibility and obscured atmospheric conditions caused by factors such as fog, dust or smoke. Millimetre-waves can also pass through clothing, wood and other building products to provide detection of weapons, contraband and for intrusion detection. Imaging at millimetre wavelengths is of importance for applications in intelligent transport systems, medical diagnostics and in civilian and military security and surveillance. As part of the research effort, CSIRO patented a novel design for a ‘millimetre-wave movie camera’ – a system for real-time imaging of moving objects, using a compact 200 GHz sensor. It became possible to conceive of this new approach to imaging because of the advanced 180-210 GHz InP integrated circuits developed through the Alliance with NGST. The MMIC-based receiver and transmitter front-ends developed for this work were the first integrated circuit-based receivers for 180-205 GHz ever developed. 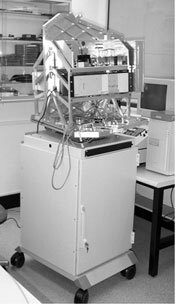 In the years following the award of the CSIRO Medal, a fully functional imaging demonstration unit was built, which proved the viability of the camera. Efforts continue to find commercial partners to take the research to the market. The development of the 200 GHz transceivers also provides an opportunity to develop the first practical, inexpensive and compact 200 GHz radios for future generation telecommunication systems. Archer JW, 2009, Personal communication.